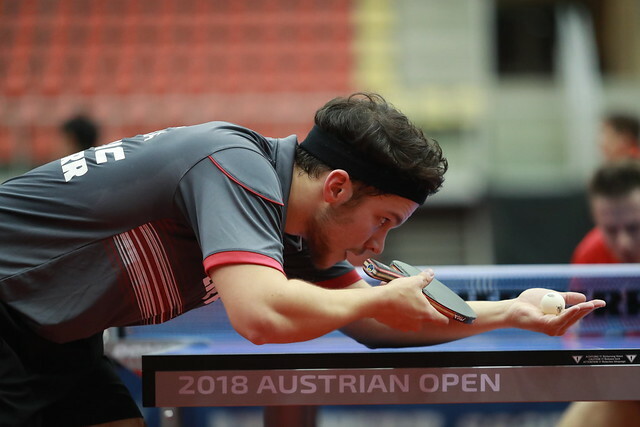 Treatment but more time was needed for recovery, just as the previous week in Sweden, China’s Ma Long was forced to withdraw from the Seamaster 2018 ITTF World Tour Platinum Liebherr Austrian Open in Linz; however, a place in next month’s Grand Finals is assured, an event for which it is anticipated he will be fit. Nevertheless, there was plenty to entertain the crowd as play closed on Thursday 8th November, Germany’s Timo Boll and in particular India’s Sathiyan Gnanasekaran provided the fireworks. The no.3 seed, Timo Boll eventually overcame colleague, Patrick Franziska by the very narrowest of decisions (11-7, 11-8, 9-11, 3-11, 10-12, 11-6, 13-11); thus he kept his hopes alive of winning the title for an unprecedented fourth time. A contest that kept the crowd on the edges of their seats but was somewhat upstaged as the evening closed. Sathiyan Gnanasekaran provided one of the performances of the day. He overcame Portugal’s Marcos Freitas, the no.14 seed, in a similarly exacting duel (4-11, 11-9, 11-9, 8-11, 6-11, 11-9, 11-7). Success for Sathiyan Gnanasekaran contrary to status, it was the same for China’s Zheng Peifeng, as well as for Japan’s Jin Ueda and England’s Liam Pitchford. Zheng Peifeng, the winner earlier in the year in the Czech Republic, caused an upset of note by beating Chinese Taipei’s Chuang Chih-Yuan, the no.13 seed (11-9, 11-7, 11-9, 3-11, 7-11, 11-5, 11-6), underlining the fact the pen-hold grip can still be a force in the modern era. Impressive from Zheng Peifeng, it was the same from Jin Ueda and Liam Pitchford who both beat host nation adversaries. Jin Ueda accounted for Daniel Habesohn, the no.15 seed (11-7, 11-7, 11-7, 9-11, 11-7), Liam Pitchford ended the hopes of Robert Gardos, the no.16 seed (11-7, 11-6, 7-11, 11-5, 11-8). Success for Jin Ueda, there were also second round places booked by colleagues Tomokazu Harimoto and Jun Mizutani; Tomokazu Harimoto, the no.8 seed, won the all Japanese duel beating Maharu Yoshimura (11-5, 11-6, 11-7, 11-2), Jun Mizutani, the no.12 seed, ended the hopes of Germany’s Ricardo Walther (10-12, 11-2, 7-11, 14-12, 11-6, 11-3). A place in the second round for Jun Mizutani and also for colleague, Koyo Kanamitsu, he was the player due to oppose Ma Long. Success for Timo Boll means a place in the Grand Finals is still open; he started the day at no.21 on the Standings (263 points), as for Chuang Chih-Yuan and Marcos Freitas, their hopes are over. Conversely Tomakazu Harimoto, Patrick Franziska, Jun Mizutani were all assured reservations prior to matters commencing in Linz.